Over the last few months I’ve signed up to various alpha- and beta-tests of games in development. Ones that I’ve spend an appreciable amount of time exploring are Metaplace, Quake Live and Magnetic Billiards – three very different projects, all of which promise technological innovation of one form or another (well, except perhaps Magnetic Billiards, which has charms of its own nonetheless). In the light of the NDAs attached to these tests (and the spirit in which participation is entered into), I don’t reveal anything below that hasn’t already been made public through previews, press releases or demonstrations that can easily be found on games sites and/or YouTube. Consider this a heads-up/reminder/call to action (delete as applicable), not any kind of review. 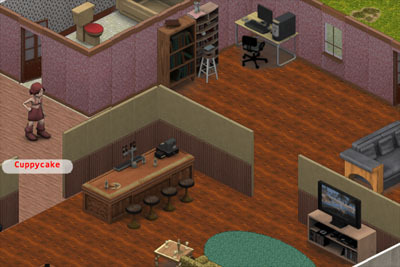 Metaplace is the current project of Raph Koster (designer on Ultima Online and Star Wars Galaxies and author of A Theory of Fun for Game Design). It’s a ‘general purpose’ virtual world platform intended to allow users of all skill levels to build virtual environments which other users can then visit directly from the browser. The main vector by which Metaplace worlds are intended to be propogated is (of course) social networking sites like Facebook, MySpace and Bebo, with the ultimate goal of making virtual worlds an everyday piece of web furniture as images, links, embedded YouTube videos and enormous content-obscuring Flash adverts. This integration works both ways, as online content can be easily dropped into Metaplace worlds (including the rather nifty ability to import objects from Google’s 3D Warehouse). Metaplace could be seen as an antidote to Second Life, designed around the likely uses to which such tools would be put (based on decades of experience with MUDs and MMOs) rather than attempting to replicate the impractical science fiction metaphor of a single, anarchic ‘cyberspace’. 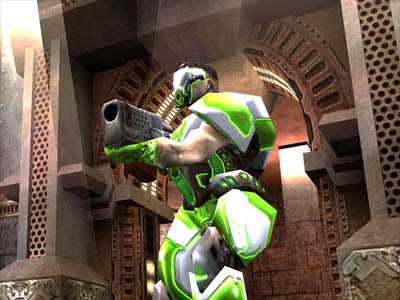 Quake Live, originally announced as ‘Quake Zero’ in 2007, is Id Software’s entry into the free online shooter stakes (the other high-profile one being DICE’s forthcoming Battlefield Heroes). The game is in essence a repurposing of Quake 3 Arena. Everyone has played Q3A, so I won’t bore you with an explanation of what it’s all about (and why it’s still the best pure deathmatch game ever made). Instead of running the clunky old 1999 executable (which always screws up my Windows colours), Quake Live runs directly from the browser, silently pulling down all the (heavily compressed) maps and assets in the background during play. All the match-making, server-browsing and stat-tracking functions are handled through an ultra-slick Web 2.0 frontend (developed by GaimTheory). Presumably there will be options to issue challenges and set up leagues and ladders and so forth. As Quake 3’s pure deathmatch gameplay is still as fresh as ever, and the game is going to be free to play (with in-game ads acting as the main revenue stream), it’s hard to see Quake Live turning out to be anything other than a huge success. Finally we come to Magnetic Billiards, which bills itself as “A Serious Game by The Pickford Brothers” (cult UK developers responsible for Feud, Plok!, Wetrix and much else). Luckily for everyone, the “Serious Game” label doesn’t mean that we’re in for a thought provoking commentary on humanitarian issues or some such nonsense. Rather, we’re treated to a physically accurate simulation of the supposed long-lost Victorian sport of, well, Magnetic Billiards. The Victorian theme is brilliantly evoked with hand-drawn art, a user interface built of wood and brass, and amusing exhortations from the crowd (“By Jove!” “My Word!” “Extraordinary!”) after each successful shot. The object of the game is to stick together clusters of balls of the same colour, which upon reaching a certain size are removed from the table. 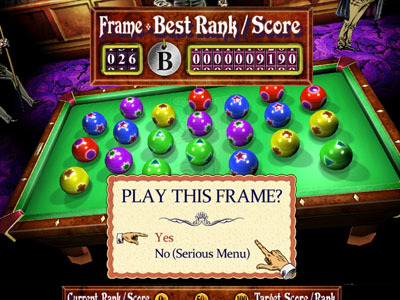 However there’s a par score for each ‘frame’ ( = starting arrangement of balls) which the player can only hope to reach by building up the score multiplier, which is achieved by making shots which involve cushion bounces and ‘buzzing’ the designated cue ball (making it pass near other-coloured balls without touching them). However allowing the cue ball to strike a wrong-coloured ball drops the base multiplier back down to zero and loses a life. This ingenious risk/reward mechanic tempts the player to try to pull off trick shots which go awry frequently enough for the successes to always feel like a genuine achievement. Even if you don’t possess the cue skills of John Virgo, it’s still possible to muddle through the game making gentle shots, and practicing the game to beat your high scores is fun in itself.